Ready to deck your halls for Christmas? We are too, so we put together a list of popular Christmas flowers that we think would make lovely additions to a home of the holidays. 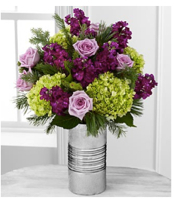 Our guide to Christmas flowers includes blooms that would look amazing on a front porch or door, in the center of a holiday dinner table, and even under the Christmas tree as a gift to be given. The following is your 2015 Christmas flower guide that we hope will give you inspiration to make your house, and perhaps your gift recipients’ abode, a warm and festive one this holiday season. 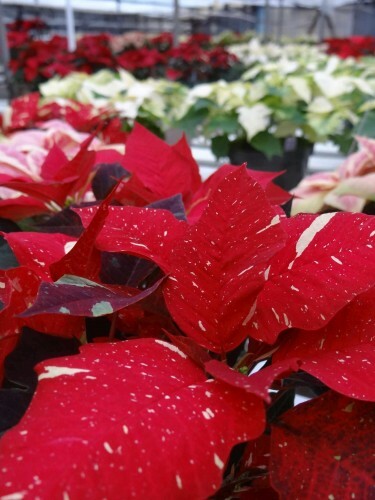 Poinsettias (Euphorbia pulcherrima) are flowers that have a longstanding tradition as Christmas flowers. They’re actually potted flowers that are typically red, but they do come in shades of white, cream, peach, pink, and marble. Poinsettias offer a splash of color outside and inside of a home. They look incredible on a hearth or countertop, and they can easily be planted in a garden for use the following season. Please keep in mind that poinsettias are toxic to pets, so if you have animals in your home these flowers should be kept out of reach. We love the idea of a Christmas cactus. This flowering plant offers the perfect festive addition to a desert home, but it can be a beautiful addition to a house in more moderate climates. The Christmas cactus blooms in winter, from November until February. It’s sometimes just called Christmas Flower and it’s a unique seasonal flower to give as a gift or decorate with. There’s nothing like a Christmas wreath to say “welcome” and “Merry Christmas.” Christmas wreaths are synonymous with holiday cheer and good tidings. They’re usually placed on the front door of a home, but we’ve seen some stunning wreathes hung over dramatic archways and fireplaces in houses. Small wreathes can also be laid flat, with a candle or other plant or object in the center, as part of a centerpiece on your Christmas table. Christmas wreaths are made from many types of plants and flowers that are bound together and shaped into the traditional wreath form. While Hypericum berries are often used in Christmas wreaths, we’ve seen some gorgeous wreaths with white lilies and red roses too. Whether you’re buying Christmas flowers for yourself or to give as a gift, we hope this guide to the top flowers for Christmas will bring you inspiration. And, we hope that you have a very Merry Christmas with your loved ones. Ready to deck your halls for Christmas? We are too, so we put together a list of popular Christmas flowers that we think would make lovely additions to a home for the holidays. 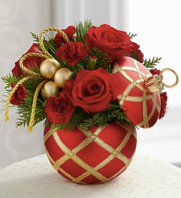 Our guide to Christmas flowers includes blooms that would look amazing on a front porch or door, in the center of a holiday dinner table, and even under the Christmas tree as a gift to be given.